Over its 46-year history, the Land Rover Range Rover earned a reputation as a capable and luxurious full-size SUV packed with advanced driving technologies. New for 2017 is the Range Rover SVAutobiography Dynamic trim from the Special Vehicle Operations division, which takes the idea of luxury to a whole new level. This new trim introduces a specially designed suspension system that provides optimal agility without sacrificing the comfort Land Rover buyers demand. Power for the new Range Rover SVAutobiography Dynamic trim comes from a 5.0-liter supercharged V8 engine paired with an 8-speed automatic transmission for an output of 550 hp and 502 lb-ft of torque. The interior features 20-way adjustable diamond-quilted leather seats, an Ebony perforated-leather headliner, a dashboard with a rich Grand Black veneer and red accents, and red paddle shifters. Even the pedals, shift controller, and Start/Stop button come in a unique knurled finish. If you want an off-road SUV with a high-end luxury vibe, this is the trim for you. If you’re not looking to jump in at the top of the Range Rover lineup, you can opt for an HSE, Supercharged, or Autobiography trim. You’ll still get that famous Land Rover capability, but without quite so much luxury and with a more affordable price tag. These trims offer a choice of 3 engines: a 3.0-liter V6 making 340 hp and 332 lb-ft, a 3.0-liter turbodiesel V6 good for 254 hp and 443 lb-ft, and the 5.0-liter supercharged V8 with an output of 510 hp and 452 lb-ft.
Those looking for more room can opt for the long-wheelbase Range Rover. Available in Supercharged, Autobiography, and SVAutobiography trims, the long-wheelbase version is 7.87 inches longer, which adds an extra 7.3 inches of rear legroom. Rear passengers also benefit from an extended panoramic sunroof with a rear-seat sunroof-blind switch. The exterior of long-wheelbase Range Rovers displays L badging on the door. The 2017 Range Rover comes with several new technologies designed to keep you safer and provide even more control on rugged terrain. These include the Advanced Tow Assist feature, which uses the vehicle’s surround-view camera to steer a trailer along trajectory lines overlaid on the image from the reversing camera. It will also guide you in hooking up a trailer and alert you if you’re in danger of jackknifing, making life easier if you’re already a trailering pro and saving endless headaches for those still getting the hang of the process. The Low-Traction Launch system is also new to the Range Rover this year. It provides manually selectable drive modes that control the amount of torque applied to prevent wheelspin and maintain traction. It’s accessed through the central touchscreen whenever Grass/Gravel/Snow mode is selected and remains active at speeds up to 30 mph. New standard driver-assist systems include rear parking sensors, cruise control with a speed limiter, lane-departure warning, and autonomous emergency braking that can slow or stop the vehicle to prevent a collision. The Driver Condition Monitor is also included, which is designed to prevent drowsy driving by tracking steering inputs, speed, and time of day and will notify a driver whose attention is slipping that it’s time for a break. The Range Rover’s improved All-Terrain Info Centre provides drivers with real-time information to help them quickly assess their vehicle’s situation and adjust vehicle settings depending on driving conditions, not to mention reminding the world of Land Rover’s British origins with those last two letters. The new InControl Touch Pro system comes with a larger 10.2-inch touchscreen and updated satellite navigation, which includes door-to-door routing and an app that syncs your smartphone with the car’s navigation system. A Commute mode will learn your regular routes and recommend changes when traffic is unexpectedly snarled, and it also lets drivers share travel data, so loved ones can know when you’re on your way home. The 2017 Range Rover has a starting price of $85,650 for the standard-wheelbase SE trim and a price tag of $170,995 for the range-topping SVAutobiography Dynamic. Long-wheelbase versions are priced at $108,895 for the Supercharged, $145,995 for the Autobiography, and $199,950 for the SVAutobiography. 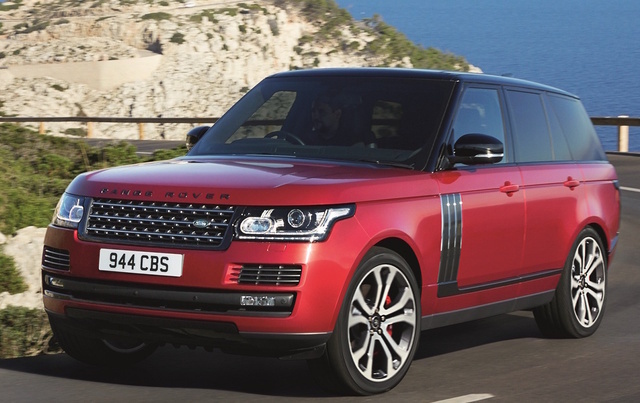 What's your take on the 2017 Land Rover Range Rover? Users ranked 2017 Land Rover Range Rover against other cars which they drove/owned. Each ranking was based on 9 categories. Here is the summary of top rankings. Have you driven a 2017 Land Rover Range Rover? I have my Range Rover on the site but would like to pay $19.99 to improve the location on your web site of my Rover for showing to possible buyers. How do I do that?